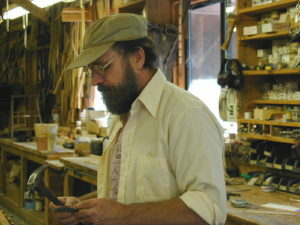 Staff - Northwoods Canoe Co.
Rollin Thurlow, proprietor of the Northwoods Canoe Company. I have spent much of my life either paddling, repairing or building wooden canoes. Introduced to canoeing via the family’s aluminum canoe in the early 1960’s, and repairing my grandfathers leaking row boat, I discovered the excitement of Maine’s lakes and rivers. While guiding Boy Scout trips in the mid 60’s down the Allagash River and other northwoods waterways, I learned the advantages and spirit of wood and canvas canoes. These trips also started my education into the repair and maintenance of these traditional working craft. 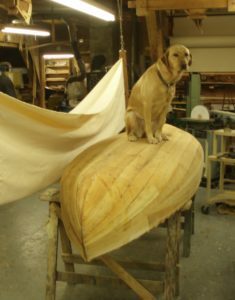 After graduation from Maine Maritime Academy and a tour of duty in the U.S.Navy, my formal education in the construction of wooden boats began when I attended the Wooden Boat Construction program in Lubec, Maine. In 1975, Jerry Stelmok and I became partners in the Island Falls Canoe Company. We were building canoes off the original E.M.White forms in addition to a wide variety of other wooden boat construction and restoration projects. In 1982, I established the Northwoods Canoe Company for the purpose of wooden canoe restoration and construction of my own canoe designs. 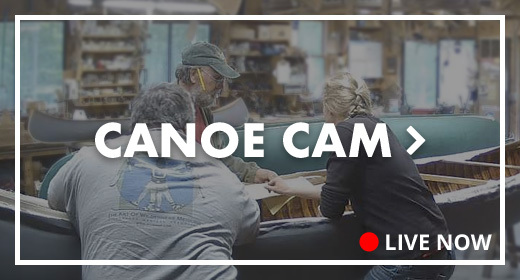 In response to many requests from do-it-yourselfers, I have developed an ever-expanding line of canoe kits, plans, and hard-to-find materials and tools. 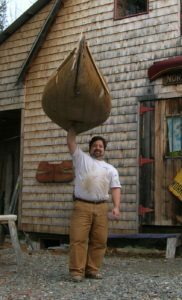 I have taught various canoe classes at the WoodenBoat School, Brooklin, ME; Buffalo State College, Buffalo, NY; Maine Maritime Museum, Bath, ME; Wooden Canoe Heritage Association, Paul Smiths, NY; and at the Wilderness Workshop, Toronto, Canada. In addition to writing many articals, Rollin and Jerry Stelmok co-authored the book The Wood & Canvas Canoe, now regarded as the definitive work on the subject. I have also produced three videos, Building the Atkinson Traveler and Steambending for Woodworkers, demonstrating wood/canvas canoe building and wood working techniques and one video, Winterwalk 2003 about a 60 day snowshoe trip through Labrador. NO canoes but a lot of fun! Elisa has been working full time in the shop for over five years. She came with a wealth of wooden canoeing experience and an eagerness to learn the details of building the craft she had used so much. Her patience and eye toward detail and quality has served the shop well. 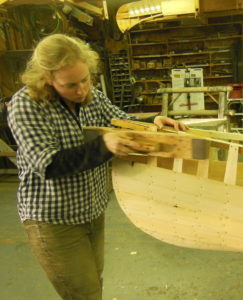 Elisa first worked with us a few years back when we were working on a Camp Darrow canoe. She was born and raised in Vermont, then graduated from Wesleyan University with a degree in English, and so naturally she ended up here, building canoes for a living. She worked at Darrow Wilderness Trip Camp for over ten years in the summers, taking groups of kids on canoe trips as far north as Labrador. 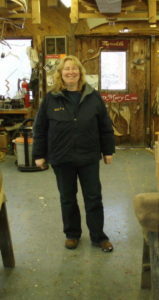 She spent time at Skywoods Canoe with Scott Barkdoll, a canoe-builder in Vermont, and with Kroka Expeditions in New Hampshire after her first stint here in 2010. She also spent a while in San Fransisco baking pies (not that we’ve seen any of the yield from those days). Pam has survived working here for over ten years and is our office, mail-order and shipping guru. She commands the phones! Unfortunately, she only works part time, so that leaves the rest of us to take up the slack. When she is here, she is also the Queen of Filler. She keeps the retail and record-keeping aspects of the business on an even keel. She came to Maine in the 70’s as a young hippie and now resides in Harmony (town of). She recently finished a nursing program after several years of juggling full-time and part-time work, school and volunteering with several local organizations. Now she works full-time as a licensed and registered nurse with the same local hospital for which Peter works, so she manages our shipping department in between her naps! Until Pam came along we were unable to keep a shipping person employed. We had been through at least five people before she started, but Pam has at last crushed the “shipping lady” curse! Peter became my first full time employee in 1993. 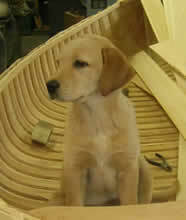 With his woodworking and mechanical skills he quickly became a valuable member of the Canoe Company. After 20 years in the shop, Peter has moved on to being a full time paramedic. After a year in school while working at the shop, he got full-time employment with the ambulance service he had been working with at the near-by hospital. He will still be in the shop a couple of days a week, as his full time medic slot is 24 on, 24 off, 24 on, five days off. Peter built the family home partially from salvaged, manufactured and home cut wood. The house is a large, modern home that is off the grid and completely solar-powered – a testament to his commitment to environmentally responsible living. Peter incorporates all his skills into our wooden boat building projects, teaching classes, and dealing with customers and phone calls. We are all entertained by his broad knowledge of rock, country, folk and other types of music and a variety of other non-essential information and trivia, especially his bank of information about Frank Zappa, Firesign Theater and movies. His words of wisdom based upon that knowledge are always very enlightening. She has been a fixture here now for over five years.